As a volunteer, we expect you to dedicate approximately 10 hours over the festival weekend (usually in two or three shifts). Punctuality, teamwork, open communication, respect and a positive attitude are of the utmost importance. 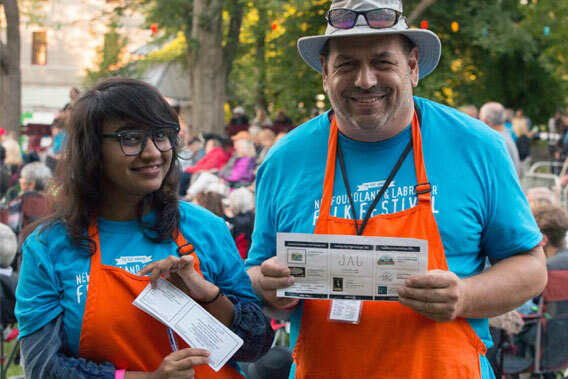 Our volunteers are the face of the Folk Festival to our audience, so a positive and helpful attitude is a must. Basic training will be provided for all positions, however please detail any relevant experience in the comment section on the form below. We will host a volunteer rally in advance of the festival to introduce you to your team. Inclusion in Action training will be offered to all volunteers again this year by inclusionNL. ensure you have enough time off to enjoy the festival. All volunteers also receive a festival T-shirt as well as free refreshments in the Volunteer Tent. Most importantly, you will enjoy meeting new friends and sharing a memorable experience with the rest of the team. We are also seeking shift supervisors for some areas, so be sure to indicate on the form if you are interested in such a position. Additional training will be provided prior to the festival. We know it can be tricky to capture your availability based on the fields we provide; if your availability does not correspond well with our available shifts, please provide as much information in the contact section below and we will try our best to accommodate you.